Johann Radmann is the sort of lawyer Hollywood loves—and they will have the chance to do so, since Germany has selected his composite story as their official foreign language Oscar submission. Radmann is young, idealistic, and somewhat rash. He also has a pretty girlfriend and all the right enemies. Much to his colleagues’ dismay, the young public prosecutor starts building a murder case against the 8,000 Germans who worked at Auschwitz. Those events leading up to the Frankfurt Auschwitz Trials are respectfully dramatized in Giulio Ricciarelli’s Labyrinth of Lies (trailer here), which opens this Wednesday in New York. Freshly appointed to the office of Prosecutor General Fritz Bauer, Radmann is such a stickler for the law, he will not let an attractive traffic violator like Marlene Wondrak off without the full mandated fine. Of course, since she is broke, he will pay it for her. It is not exactly a meet-cute, but somehow it will suffice. Fortunately, Radmann will also get a timely assist from crusading journalist Thomas Gnielka. Recently, Gnielka tried to make a scene in the prosecutor’s office to call attention to the many National Socialist war criminals living openly in West German society. Radmann was the only one listening. When he tries to follow-up on reports of a concentration camp guard teaching high school, the road blocks thrown in his way by officialdom serve as quite a wake-up call. Of course, Radmann is not about to simply drop the matter, but he will have to get more organized. By 1958, the statute of limitations had run out on all National Socialist crimes except murder, so Radmann will have to tie the school teacher and his former comrades to the actual mass murder at Auschwitz. Fortunately, he will have the personal backing of the universally respected Bauer. In time, he will uncover some potentially game-changing evidence, but his obsession with capturing the notorious Josef Mengele threatens to distract him from more winnable cases. No so surprisingly, the combined stress threatens to derail Radmann’s once promising romance with Wondrak. In many ways, Labyrinth is a smart, honest, and insightful film, but the decision to end it just as the Frankfurt Auschwitz Trials begin is rather strange. The film thoroughly primes us for some dramatic cross examinations and stirring closing statements, but then it simply relates the outcome in an anti-climactic post-script text. Still, a number of sequences bristle with power, such as the wordless montage depicting the overwhelming depositions given by Auschwitz survivors. Ricciarelli and co-screenwriter Elisabeth Bartel make the depths of the older generations’ denial and the younger generations’ ignorance disturbingly clear. Unfortunately, the serious business is too frequently interrupted by Radmann’s groan-worthy relationship travails. 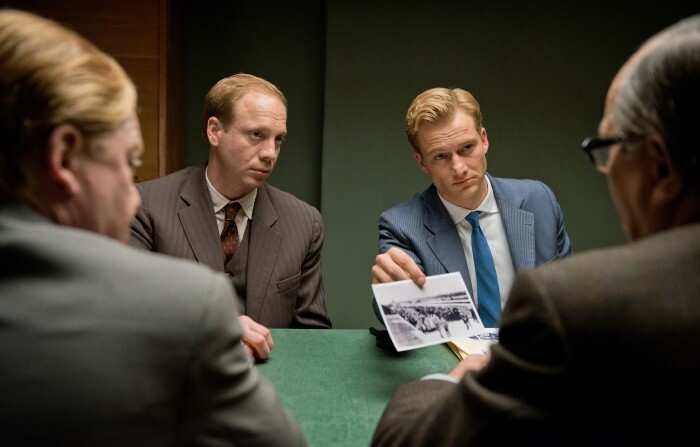 It is good that the Radmann character is believably flawed, but Alexander Fehling’s portrayal never seems to grow in maturity or stature. However, he is surrounded by some remarkably accomplished supporting work. The chameleon-like Johannes Krisch (seen at TIFF in Jack) is absolutely devastating as Simon Kirsch, the artist and Auschwitz survivor who inadvertently set all the events in motion. André Szymanski is also charismatically rebellious but credibly grounded as the real life Gnielka, while the late Gert Voss personifies stately gravitas as Bauer. Although the reality of the Holocaust is largely accepted today in Germany and the rest of the West, Labyrinth still offers some eye-opening revelations when it explains how closely Bauer coordinated with the Mossad during their campaign to capture Eichmann. It is a well-intentioned period production that evocatively conveys the look and atmosphere of the Adenauer “Economic Miracle” era West Germany. However, some of its narrative choices are a little puzzling. Nevertheless, its dramatic and historical merits are greater than the mild assorted reservations it spawns (still, it cannot match the intensity and artistry of Christian Petzold’s Phoenix, which Germany passed over in favor of Labyrinth as their Oscar contender this year). 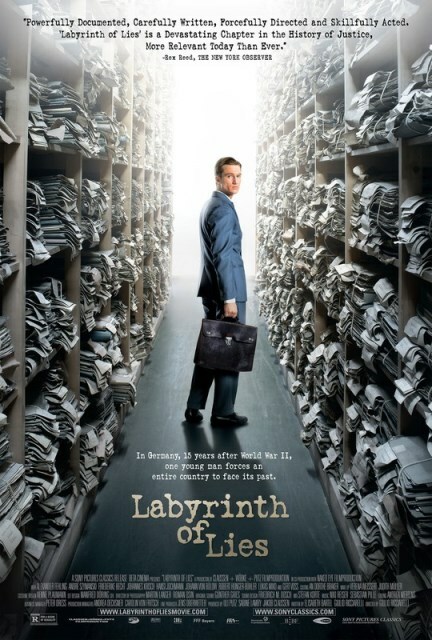 Recommended accordingly, Labyrinth of Lies opens this Wednesday (9/30) in New York, at the Angelika Film Center and Lincoln Plaza.